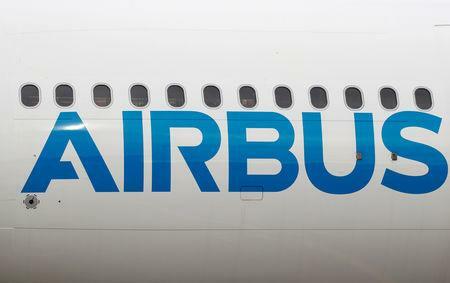 PARIS (Reuters) - Europe's Airbus lost out to Boeing in 2018, breaking a five-year winning streak against its U.S. rival for the number of jet orders, slumping to its lowest share of the $150 billion jet market in six years, data showed on Wednesday. Airbus posted 747 net 2018 orders, down 33 percent from the previous year, including 135 for the A220 jetliner which it took over from Canada's Bombardier in July. Boeing beat Airbus for the first time since 2012 with 893 net orders. Airbus delivered 800 jets, up 11 percent, including 20 of the small A220 model, leaving Boeing as the world's largest planemaker by manufacturing volume for a seventh straight year. Although Boeing missed its delivery target and Airbus had previously lowered its target due to strains on the industry's global supply chain, strong demand for passenger jets expanded total deliveries by 8 percent, the fastest pace in six years. Planemaking chief Guillaume Faury welcomed the deliveries, which set a company record, and a "healthy order intake," with waiting lists for many new jets stretching for up to 7 years. The order figures underscore Airbus's decision to take over the lightweight but loss-making Bombardier CSeries aircraft, generating 135 orders worth $12 billion at list prices. Without that boost, Airbus took just 41 percent of the core market in which it competes with Boeing, the lowest since 2009. The world's largest airliner is mostly dependent on Dubai's Emirates as Airbus slows production to a trickle in the hope of a future upturn, though many airlines are for now backing smaller jets.